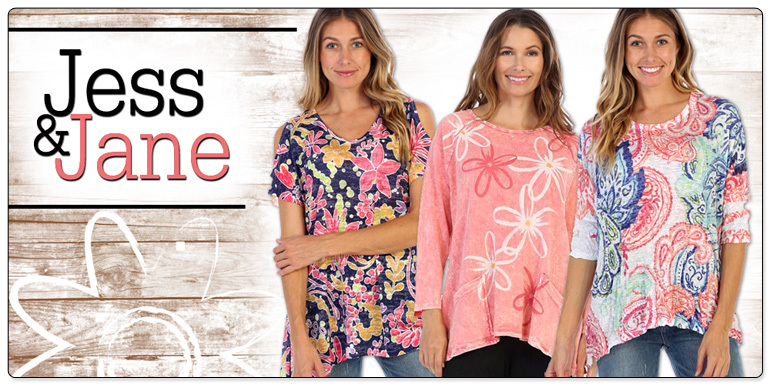 Jess N Jane quality printed women's tops, tunics, jackets, leggings, slinky knits, mineral wash, and sublimation prints. I bought my first Jess & Jane shirt this year ... and loved it so much I tried to find other styles.....The quality, the comfort, the look; it's all just great....Thanks for carrying such a large selection and I hope you never quit because I will be a repeat customer. Brenda E.